The carbon dial table (CDT) has many advantages, but the primary advantage over traditional materials is weight. The low weight of the carbon dial table provides the dial indexer assembly machine manufacturer the opportunity to dramatically reduce table index times. 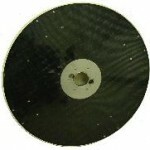 A Carbon Dial Table with no central through hole is defined as a blank carbon dial table. The weight of a blank carbon table was determined for CFCD001 material at two core thiknesses 1000(A) and 2000(B) and minimum carbon layer R02. The weight includes the polyurethane edge. Carbon Dial Table compared by weight to the following traditional dial table materials: 1" thick aluminum and 1" thick steel. Values of thickness and weight for the blank carbon rotary table are nominal.